Mgr. Jan Došla Ph. D., Mgr. Renáta Vychodilová, doc. 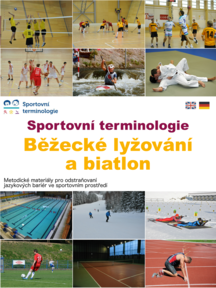 PaeDr Jan Ondráček., Ph.D.
Buy one of the Sport terminology e-books and get Basics of sport terminology for free. The interactive multimedia language e-textbook is an educational aid designed with the use of modern technologies. Its aim is to extend the knowledge of foreign languages in the area of sports terminology. The textbook focuses on practicing and building up the vocabulary of selected sport in English/German language. This modern educational tool can be used for foreign language teaching at universities, secondary and language schools as well as for self-study. The particular chapters of the textbook focus on the general introduction of the selected sport, movement and game skills and game combinations, sporting facilities and equipment, and the rules. The textbook practises basic language skills such as reading, listening and writing in an interactive way. In case of teaching in groups, speaking is integrated too. The textbook extends language competences, which may potentially enhance the competitiveness at the labour market.